Jaipur: The third day of the ZEE Jaipur Literature Festival began with appearances by some of the bestselling women writers on the planet. Julia Donaldson is the fourth best-selling British authors of all time; Helen Fielding’s Bridget Jones books and their film adaptations have been international success, and Amy Tan is an iconic figure to Asian American population. Folk tales formed the basis of many of Julia Donaldson’s works, including The Gruffalo, revealed the talented writer. It had been no mean task to come up with and develop the idea of The Gruffalo, she said; she had gone through pages after pages of scribbles in order to craft them into a coherent narrative. For the development of the Gruffalo’s physical characteristics, Donaldson had made lists of descriptive words and sieved out those that had rhymed. In her journey to make reading magical for children, she had tried hard to avoid repetition and find musicality in her words. In Bridget Jones’ Diaries, reading an excerpt from her book, author Helen Fielding said, “being a woman is worse than being a farmer”. She reflected with wry humour on the amount of effort that went into becoming pretty and “dateable”. She emphasized that society was full of oppressive stories of women that needed to be written and said out loud. The Joy Luck Club saw Amy Tan agreeing with the fact that imagery was important and the current book she was writing had actually come to her in a dream which hadn’t been the case for her breakthrough novel The Joy Luck Club. That modern classic had arisen out of a necessity to address her relationship with memory and identity. At the AU Bank Samvad, Sheila Dikshit, the three time Chief Minister of New Delhi took the audience through her lifelong journey of being the only female politician in India to be part of a select, overwhelmingly male band, in the launch of her hit book Citizen Delhi: My Times, launched by Sanjoy K. Roy and Karan Thapar. A world where people die because of poisonous air, polluted water and chemical-laden food isn’t science fiction anymore but the reality of our times. The ZEE Jaipur Literature Festival 2018 featured Jeffrey Gettleman, Pankaj Sekhsaria and Prerna Singh Bindra in conversation with Amita Baviskar analysing the chilling effects of climate change on our civilization in the session In Denial: Betrayals of the Earth. In The Future of New Writing, the Festival hosted a diverse panel of writers exploring forays into the new world. Indian poet and author Jeet Thayil observed that the novel is “constantly open to innovation” and “wraps itself around” anything you throw at it. “Even when people like V.S. Naipaul say the novel is dead, you shouldn’t believe it.” American novelist Joshua Ferris however disagreed and said: “I do think the novel is dying.” In his opinion, the novel has come under “extreme pressure”, especially since the election of Donald Trump as US President, because people now find “the most interesting novel” in the news. In the session on Adaptations, and all-star panel of Mira Nair, Michael Ondaatje, Tom Stoppard, Amy Tan and Nicholas Shakespeare discussed the metamorphosis of the book to the screenplay and how in the latter, the writer has to accept that the director’s vision becomes paramount. Acclaimed director of Shakespeare for the stage Dominic Dromgoole recalled touring a production of Hamlet around the world and the varied reactions it got. ‘For me, seeing the audience react to the play through their body language is part of the pleasure’. 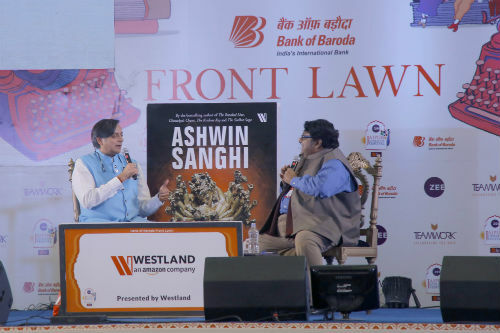 In a packed final Bank of Baroda Front Lawn session, in conversation with Arundhathi Subramaniam, Shashi Tharoor explained the thought behind his latest work Why I Am A Hindu? For him, his faith was the perfect one for the 21st century as it had plurality and individual choice built into it, but allowed others to follow their own paths. It builds not just tolerance, but acceptance between peoples of different views. Amidst many such thought-provoking, witty and wonderous discussions, the curtains fell on the third day of the charged Zee Jaipur Literature Festival.